A U of T Scarborough study finds that a unique ritual performed by male ring-tailed lemurs may come at a significant physical cost, but it could help their chances in securing a mate. "Stink-flirting displays are done more often by dominant males," says Amber Walker-Bolton, lead author and instructor in U of T Scarborough's Department of Anthropology. "This behaviour is also very costly because these males are met with higher levels of aggression than if they were to do other types of scent-marking, so there's definitely something unique about this type of behaviour." Ring-tailed lemurs are Strepsirrhinines, a sub-order of primates who share a common ancestor with humans. They are very social animals, living in large groups with females dominating the group. Like other lemurs, they huddle in large groups in order to keep warm and maintain social bonds, with lower ranking males often excluded. Scent is also incredibly important to ring-tailed lemurs. Males use their scent glands to mark territory and often engage in so-called 'stink-fighting' displays where they rub their tails in their scent before wafting it at an opponent. While stink-fighting is well known, stink-flirting, where males do scent-wafting displays towards a potential female mate, is less understood. This study is the first to look at these displays and their role in terms of male rank and female mate choice. "One morning I was watching a huddle and saw an outsider male approach and try to waft his tail to a female. Well, right away he was met with all this aggression from the group, and it made me question why they would go through this just to be met with a negative result," says Walker-Bolton, who did her field research at the Berenty Reserve in Madagascar. It turns out that dominant males, both from within and outside the group, engage in stink-flirting behaviour the most, but it's outsider males who perform the behaviour at a much higher rate. As a result, they're also met with much higher rates of aggression from females and other males. "It could be a way for them to show their rank or it may simply be an alternative mating strategy in terms of transferring to a new group to gain mating opportunities," says Walker-Bolton, who also served as a consultant on the IMAX film Island of Lemurs Madagascar. "One thing is for sure, there's a lot of aggression directed towards them, and it's a costly thing to do since it can end in such a gruesome fight." 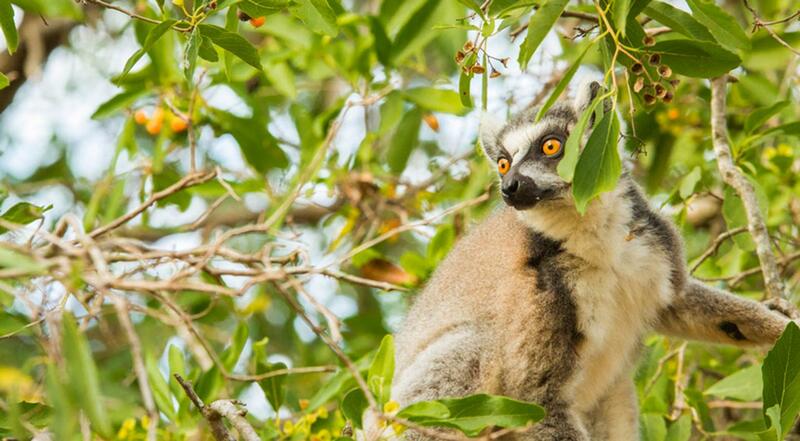 Despite being relatively small in stature, these lemurs can pack a punch. During attacks, it's not uncommon for them to jump in the air and strike at an opponent with their sharp nails and sharp teeth. It's also common for a female ring-tailed lemur to lunge out and slap an opposing male across the face. The study didn't find a correlation between stink-flirting displays and mating success; Walker-Bolton says it was too difficult to measure mating success accurately. But she was able to measure how often females presented themselves, a mark of how receptive they were to the displays. "Females don't present every time, and they don't present to every male, but it's interesting that males who engaged in a greater number of stink-flirting displays were presented to more often," she says. Walker-Bolton says the next steps for this particular study is to see if there's a correlation between these displays and reproductive success. The study, which received funding from a Roehampton University scholarship and a L.S.B. Leakey Trust grant, will be published in the American Journal of Primatology.